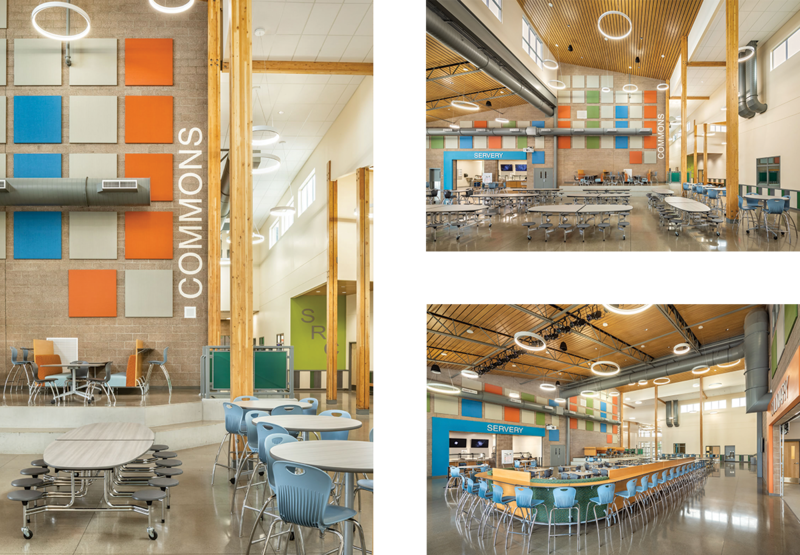 Opened January 2018 in Springfield, Oregon, Hamlin Middle School is preparing students to think critically as well as creatively. 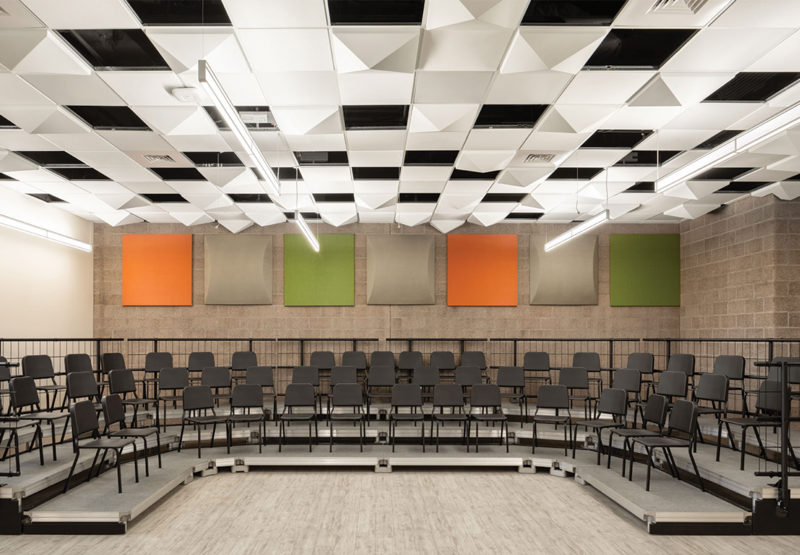 With classrooms called “learning studios,” the new school emphasizes the project-based STEM+Arts curriculum known as STEAM, integrating Science, Technology, Engineering, Art, and Math. The campus features a modern two-story, 123,000-square-foot building designed to accommodate up to 750 students and required a number of versatile areas. 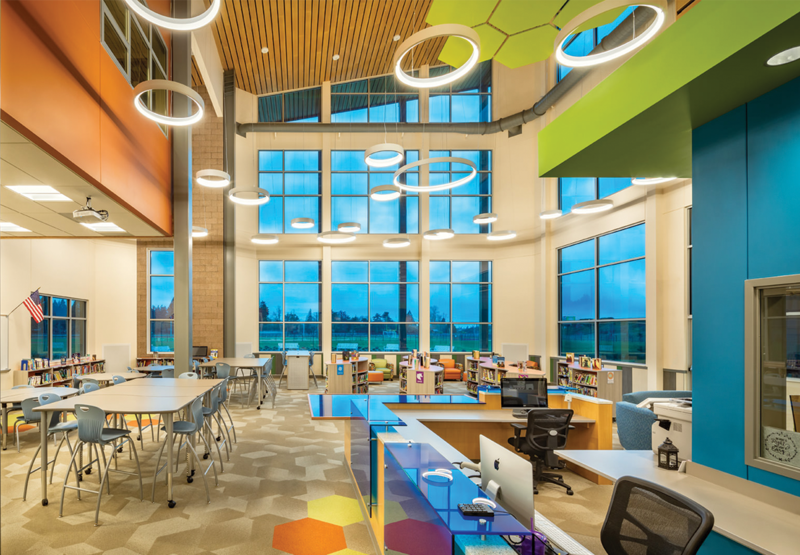 When the time came to outfit this innovative space, school officials wanted furnishings that could easily adapt to a variety of purposes. Virco PlanSCAPE delivered with a mix of solutions. Over a five-month period, Hamlin Middle School officials invited Virco’s PlanSCAPE team to sit in on meetings to discuss the goals, needs and wants for the new campus. A detailed vision emerged, with flexible, STEAM-focused spaces topping the list. 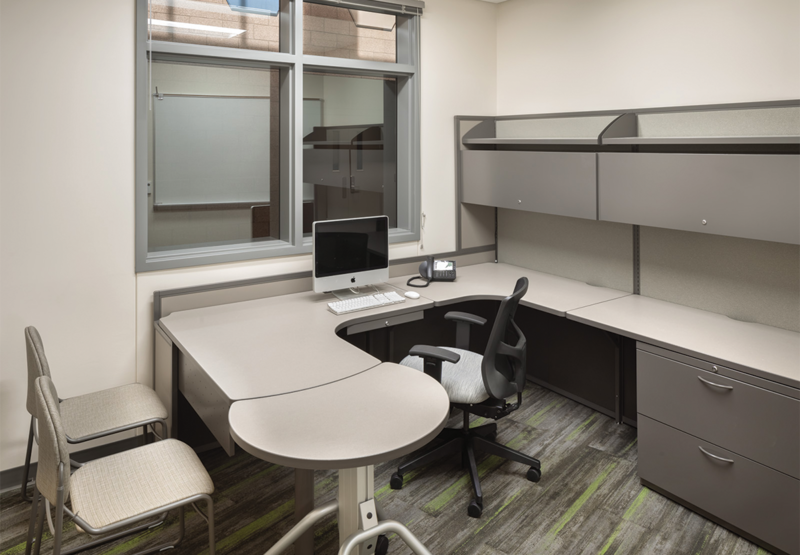 To bring the vision to fruition, two pilot classrooms were created in the existing middle school. 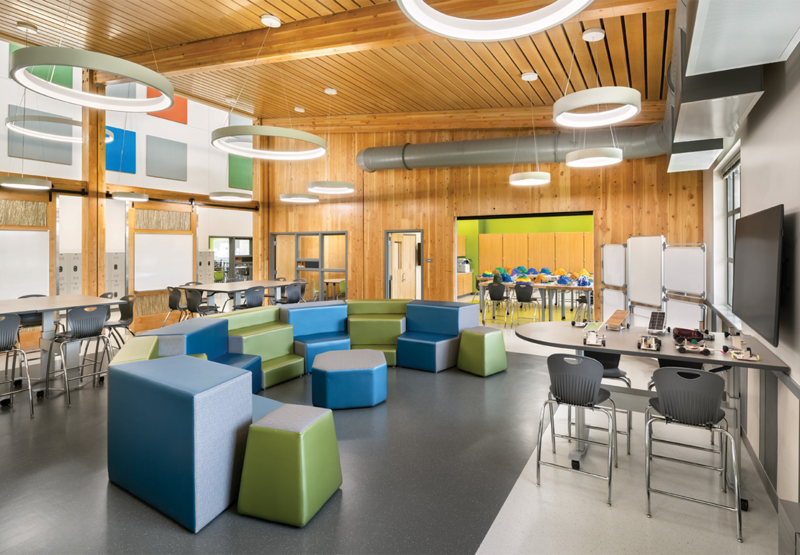 Here, teachers were invited to test drive the rooms with their students and trained how to use the adaptable furnishings to suit multiple teaching and learning styles. Based on the teachers’ feedback, a plan was created to include a mix of activity tables and chairs in three different heights. The staff lounges and administrative area presented a unique challenge. The offices were built with irregular angles, and the reception area included prefabricated desks with no storage such as file and overhead cabinets. The PlanSCAPE team worked around these issues to create a seamless look throughout the space, right down to matching the hardware and laminate on the desks. And, thanks to Virco’s cost-savings U.S. Communities Contract, the project came in on budget. Flexible seating arrangements in the cafeteria create multipurpose spaces. In addition to booths with soft seating and café-height chairs, mobile tables with casters allow for easy re-arranging when the space is used as an auditorium. 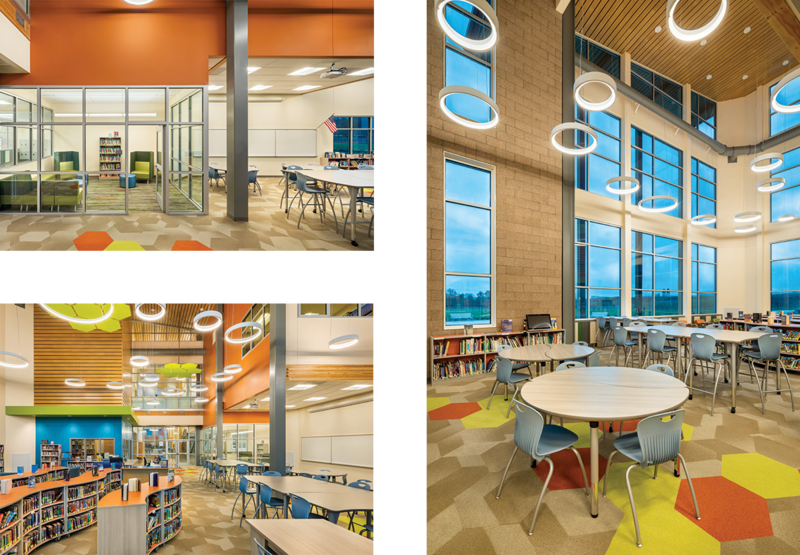 Doubling as a classroom and meeting space, the media center needed furniture that could be reconfigured in a moment’s notice. It features various-height ZUMA Series Chairs, 5000 Series Activity Tables, soft seating, and wood bookshelves. Staff Lounges include a space for teachers to meet and collaborate, featuring a range of seating options, including café-height tables and soft seating. Learning Studios, or classrooms, featured tiered classroom settings and were furnished with tables and desks in three different heights, from standup height to 30-inch fixed height. 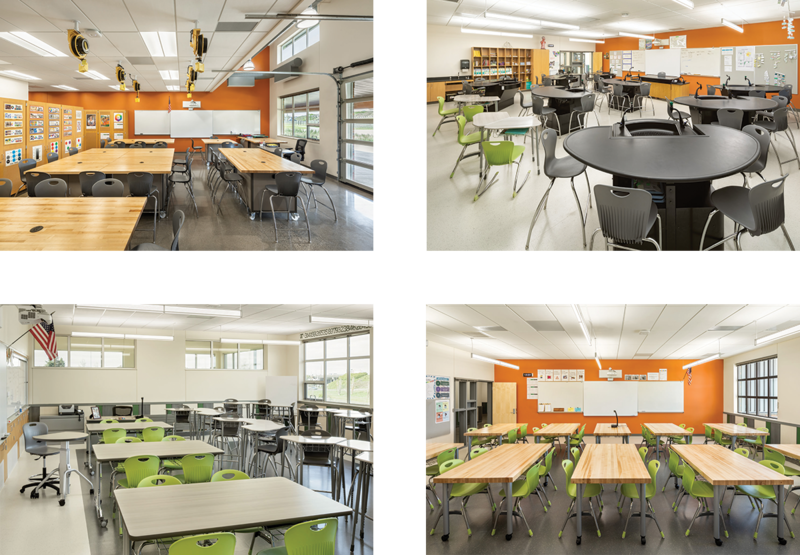 Science labs include activity tables with custom woodblock top surfaces and soft seating.